Helen began re-imaging the Alice in Wonderland characters in September. 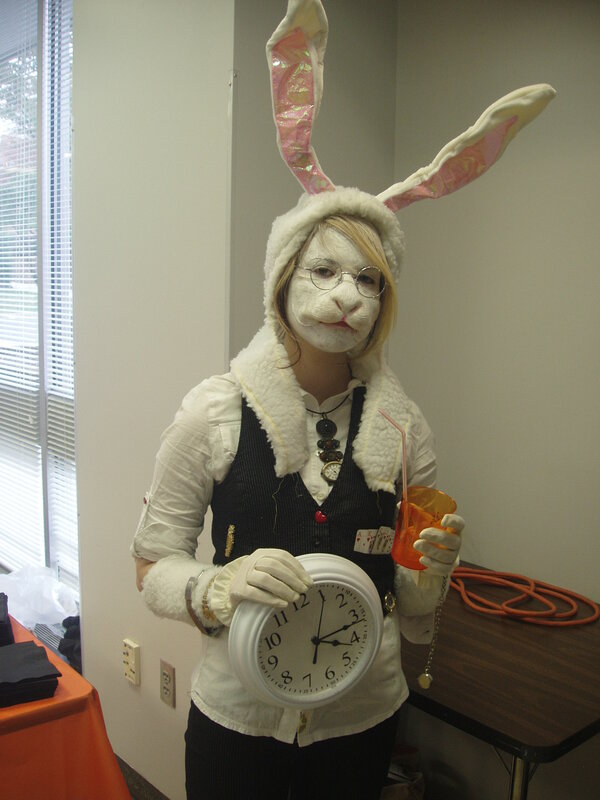 We had the White Rabbit, of course. Sam was the Mad Hatter. I don’t have a picture yet but this is his hat. It is made from a hat form acquired at a craft store and an inverted lamp shade. The top is cut from a pizza box secured with antique button ‘hinges’ to make a ‘liftable’ lid. 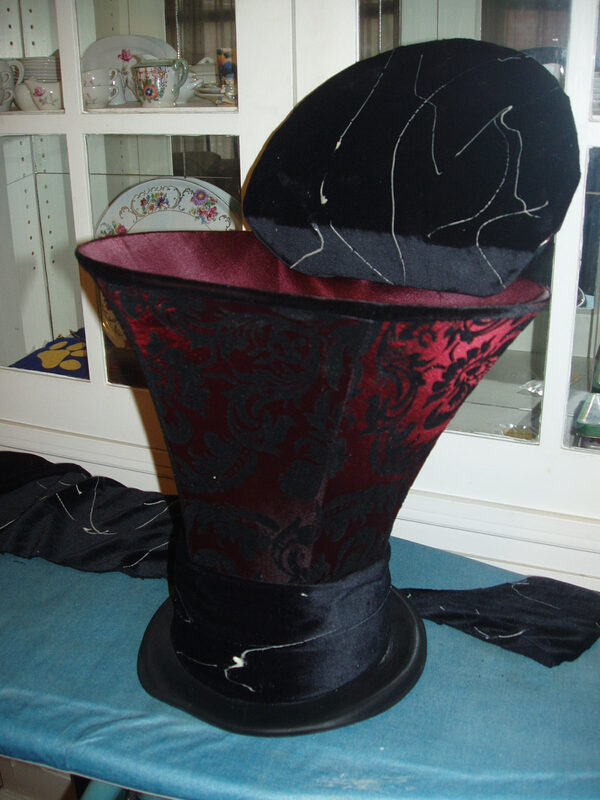 Ever ready for a spot of tea, Hatter keeps a tea set inside his topper. 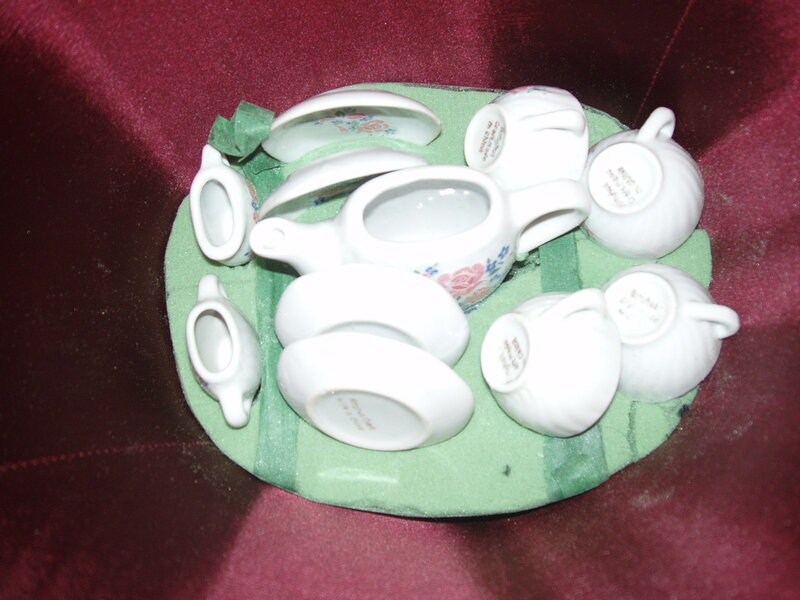 Florist foam makes a nest for a toy china set for four including tea pot, creamer and sugar. Typically, when I found the camera the night before the event, the battery was next to dead and no one could find the charger so I didn’t get pictures of Sam. He wore the hat and spiral glasses. Given that the Hatter tends to be formal, he wore dress pants. 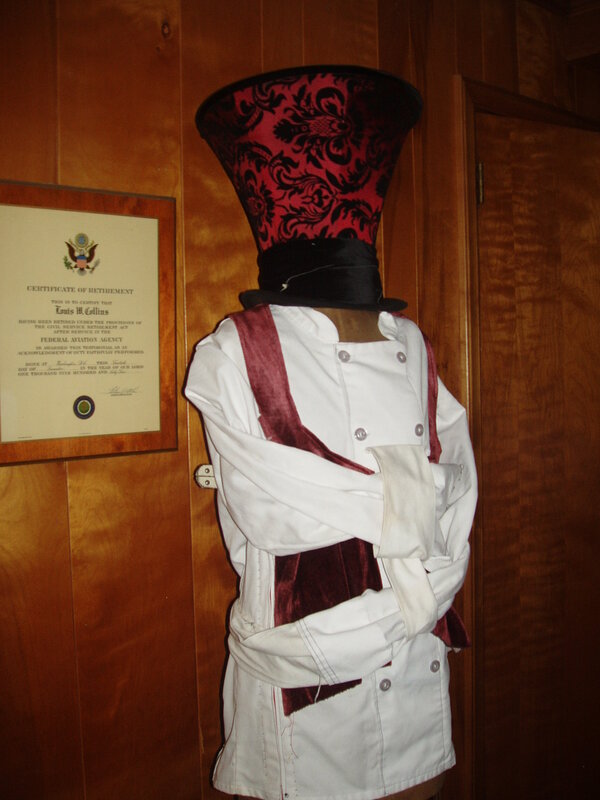 Given the Hatter was mad, he wore a strait jacket. Helen was particular about him wearing a vest as the Hatter does have some dignity. Here are some pictures of the outfit sans Sam. Zippers and straps for that tailored look. The jacket is a modified chef’s coat with zippers in the front and back to give it a sleeker fitted look. The buckles are from Helen’s old belts and the collar secured with a leather watch band. The ‘vest’ is made from a thick upholstery velvet–quite grand. We also had a Queen of Hearts (that would be me), a King of Hearts (Jeff) and a sweet six foot tall March Hare (Julian). Hopefully I will be able to pull some pictures from Facebook or the yearbook advisor. This was all Helen. It was really fun to see her go from an idea to a concept to drawings. From there I got to play tech assistant, hitting thrift stores, poring through boxes of buttons, remaking clothes to fit her vision. Terrific, as expected! Looking forward to seeing the other photos.